BETSY BEAUMON: Hello, this is Betty Beaumon, and I’m the CEO of Benetech, and this is your Assistive Technology Update. JOSH ANDERSON: Hello, and welcome to your Assistive Technology Update, a weekly dose of information that keeps you up-to-date on the latest developments in the field of technology designed to assist individuals with disabilities and special needs. I’m your host, Josh Anderson, with the INDATA Project at Easter Seals Crossroads in beautiful Indianapolis, Indiana. 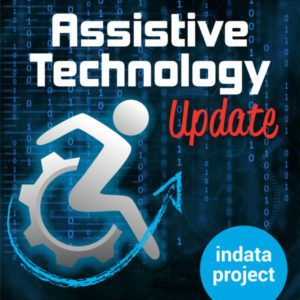 Welcome to episode 390 of Assistive Technology Update. It’s scheduled to be released on November 16, 2018. On today show, we are very excited to have Betsy Beaumon, the new CEO of Benetech, on the show to talk about Benetech, what they do, some think they have in the works, and some of the excitement she has for taking over the reins of such an amazing organization. We are also very excited that next week is coming up our holiday episode. If you’ve never this into our holiday episode, we usually try to have that come out on black Friday. What we do is we have a rundown of some different assistive technology and other technology devices that are out there for the holidays. Kind of think of it as a gift giving guide, or maybe a gift getting guide. Who knows? But we try to have a little bit of fun with it, talk about the holidays. I’m very excited. We will have Brian Norton, who is very popular host of our sister show, Assistive Technology Frequently Asked Questions. We will have Nikol Prieto who has been on the holiday episode since it started. She is a big Halloween fan, but we get her out in the holiday mood in order to record that show. And the return of Wade Wingler. That’s right, the person who hosted this show for many a year before handing the reins over to me will be back to talk about some of his favorite gadgets and things and be able to sit in the interview chair as opposed to the interviewer chair. So we are very excited to have those folks on. Make sure to check that out next week, but let’s go ahead and get on with the interview for today. JOSH ANDERSON: Benetech has been a leader in using technology for good since 1989. I’m sure that many of you have heard of — and probably used — book share in your daily life. That’s Benetech. But that’s not all it does to help people all over the globe. Benetech is also welcoming a new CEO to the organization, and we could not be happier to have her on the show to talk about her journey, talk about Benetech, and talk about what the future holds. Betsy Beaumon will be taking the reins of Benetech but has been kind enough to take time out of her scheduled to speak with us today. Betsy, welcome to the show. BETSY BEAUMON: Thanks very much. It’s great to be here. JOSH ANDERSON: We can’t wait to talk to you about Benetech and your exciting new position. But before we talk about that, can you tell our listeners a little bit about your background? BETSY BEAUMON: Sure. I am in an engineer, much like our founder Jim Fruchterman, an electrical engineer. I spent a number of years in the tech field and the for-profit world from semiconductors to data communications and lots of time in the software industry. I’m also a social entrepreneur, so I started my first social enterprise back in the nineties. It connects to some of the new work we are doing that we will talk about in a little bit, I’m sure. I also helped cofound a global trade management software company. I’ve done raw startups. I was brought to Benetech after we got our big award from the Department of education. We really needed to grow. As many of your listeners may know, book share was pretty small for a long time, doing great work but not breaking out. And then really that was a point where the need was obvious in the educational world. Book share one a competition around that, and all of a sudden Benetech was faced with the need to actually grow this little venture and do a lot more with it and get to what is not over 600,000 users. Again, we can talk more about book sure. But that’s really what I was hired to do at Benetech. I ran that, did that growth, and got us into of the things in the accessibility space like the diagram center that does R&D around science and math and helps beyond text and some other areas. I’ve been our president for the past four years. JOSH ANDERSON: I know that some of our listeners to know about book share. But for those who don’t, can you tell us what books share is? BETSY BEAUMON: Book share is the largest online library of accessible e-books all over the world. We now have users in over 70 countries. As I just mentioned, we have over 600,000 users. When I started, which was just about 10 years ago, I think it was about 20,000 users. So we’ve grown significantly in that time, and I’m very proud to say we’ve not only grown a number of uses but actually the amount of usage. We have all over 1.5 million downloads or usages every year. We know have people using book share on phones, tablets, computers, as well as specialized devices — Braille displays is a really important one — and commendation of all of those things. One of the interesting things we started doing in the past few years on book share is really looking around and saying, wait a second, we are a Silicon Valley software-for-good organization. We are good at this software stuff, and we had some good funding from the US Department of education to build out the platform for US students. But this could not only be useful as book share around the world, but our platform could really be useful for the other global libraries for people with print disabilities. So we are now offering a private label version of book share so that organizations, as well as individuals, can take advantage of the power of book share. What’s even cooler about that is that means as we’re doing new updates for, say, a student need in the US, that also translates to updates that these other libraries who are running on the book share platform get to take advantage of. JOSH ANDERSON: How was Benetech started? BETSY BEAUMON: Benetech goes back in — you mentioned 1989. It goes back to the days of what was originally Arkenstone. Jim Fruchterman, our founder, who — as you mentioned, I am taking over the reins from — actually founded Arkenstone in 1989 as one of the early reading tools that could read accessible books. And then fast forward, he ended up selling Arkenstone to freedom scientific. Because Arkenstone was a nonprofit, it’s not like he got to pocket all that money. He actually turn that into Benetech, because freedom scientific also bought the name “Arkenstone.” For those of you who are Lord of the Rings fan, you will recognize that terminology. What ended up happening is he said, wait a minute. There are lots of issues to solve in this world, definitely some in the accessibility space, but other ones as well. It was around 2000 when things were going absolutely bonkers here in Silicon Valley. The idea was we could solve more problems, more social issues with software. So that’s how Benetech was then born. JOSH ANDERSON: Very nice. I know Benetech does a lock all over the world, and we will get into those. But what are Benetech’s goals, the core that keeps it running? BETSY BEAUMON: I always like to start more with the vision side of it. BETSY BEAUMON: We’ve been honing how we talk about that, and that’s partly based on the work we are doing and based on why is it important. I think a lot of us, especially as engineer types, spent a lot of time talking about data and numbers and what we are working on and the cool tech underneath it. But what is most important is why we are doing this. We are doing this because we believe in a feature that empowers inclusion and equality. So if you are not included or you are not treated equally, that’s really a problem. and anybody deserve to read and learn; everyone deserves a shelter, food, and care; everyone deserves for his or her voice to be heard; and every victim of human rights abuses deserves justice. Those things underline the work that we do, and the actual goals come out of that. We are actually working in a number of issue areas that had all those things, they are all connected by inclusion and quality. I realized when I said that earlier, it might’ve sounded like inequality. It’s “and” equality. Some of our goals are around things like book share, so providing access to education, learning, employment, pleasure reading, and really being a connector between the publishing industry, who we work with extensively, and students, teachers, parents, adults, etc. We are also really looking at goals around information on services. So we will talk about more of our new stuff, but includes something called service net, that’s really around how can we better help connect social service providers and referral agency to the actual people that need their services. We also do a lot and the human rights areas. That’s been one of the things that, for as long as book share has been around – which is 2002. Might around that time, around 2003, Benetech also started the human rights program. So for many years, our goals have been how do we protect human rights defenders and help them do their work better and make sure that they and the beneficiary is they are trying to help all stay safe. I think it’s a lot easier for people to visualize that now than it was maybe for some people 15 years ago because a lot of those issues where data wasn’t secure seemed really far away. We often did work with people very far away in really dangerous countries. Now we are really evolving that and looking at things like how can we help people with disabilities actually achieve more of their rights. The UN convention on the rights of persons with disabilities has been around for 11 years, I think, and it’s really a big driver. But there are lots of rights that people are supposed to be getting in countries all of the world that, when you actually talk to people with disabilities, they say, well, I’m not actually quite getting access to education, or I’m supposed to be getting into transit with my wheelchair, and in fact the transit system isn’t ever or isn’t always accessible to me. So there are lots of issues that come up that we really want to work on more in the human rights space. JOSH ANDERSON: Very nice. How are you working to achieve those goals? BETSY BEAUMON: The way we work is we are a software organization. As I often tell people, we are like a software startup, except that everything we do isn’t about making money. Everything we do is about impact. Our goals over the next five years are to impact tens of millions of people. We are well on the way to that. The way we do all that impact is scale. To skilled things, software, technology is one of those tools. We are not the techie people that think that tech instantly solves all social ills. One of the ways we really do that is through community. That doesn’t just mean the community around you in your neighborhood, but it means communities of people. For example, communities of people with print disabilities. Book share started as literally what the name says, book share. It was using a tech platform to enable people with print disabilities who were already scanning books so that they could read them through their computers. It was saying, you know, it’s actually legal, if we do this right, to share those books so that one person’s scan can serve many instead of, as was happening, thousands of people running out and scanning the next Harry Potter book or whatever was coming out at the time. Now we are at the point where we get most of our books from the publishers. We’ve now not only brought in the community of people with print disabilities themselves who really built a book share, but also publishers who are continuing to build book share because we have agreements with over 850 publishers to give us their books. That’s one example of connecting communities in order to provide access to information. Service net, that I mentioned, is another new kind of one of those where there are lots of groups out there that actually have data, databases that talk about what are the human services in the area. The problem is there are a whole bunch of them, and they don’t actually connect to each other. If you go to one, you might hear about that really interesting food bank down the street that serves you. If you go to the other one, they might not have that listing. Now there is a hole in the social safety net that we are sending someone off on a wild goose chase for either service they are not qualified for, services that are closed. Service net is a way we are working with the community and saying we can connect the data you have together so that the social safety net is stronger. Whether the community are individuals like book share, or whether it is other organizations, nonprofits, community groups, government, we really believe that connecting communities and access to information are two of the big underpinnings of inclusion. JOSH ANDERSON: It sounds like you’re giving people not just the tools but the power to work together. That’s very important. In looking through about you, I found something called Born Accessible. Can you tell me about that? BETSY BEAUMON: I can. I’m very proud to have that term associated with me. I was in a lot of publisher meetings back in the day when I was running book share. At one point, they started talking about all of their content should be “born digital” or “now’s the time,” things are going to be made e-books first and maybe they’ll get printed. They could do all kinds of new things because they would be fully e-books and fully electronic. I sort of sat there and said, goodness, what we do in book share and take things on paper — it’s hard to make that accessible — and turn it electronic so that it can be made accessible. So I started this mantra anything born digital really should be born accessible. You could look at that as kind of a stick that there are no actresses anymore for not to be accessible, or you could also look at it the way we tried to work it, which is a carrot. We can talk to the same publishers that we have built great relationship with, and in fact others who might not be so thrilled about giving the book to book share, but say, yeah, if I can sell books are more accessible, then I’ll do that. So we are actually working with lots of publishers now, and we’ve worked with the Daisy Consortium, which is the global group of libraries for people with print disabilities who are meeting, and basically saying let’s do a lot of work to pull these things together. George Kircher, who I have to give a shout out to because he’s done great work as sort of the person, who was not only at the time Secretary-General of the Daisy Consortium, but became the president of the IDPF, the International Digital Publishing Forum. I know people get bored about talk about techie things like standards, but that was critical. You meant that the same standard that e-book producers use commercially now has accessibility built in. That was an underpinning that made it possible, but now we are actually certified publishers’ books to say it meets a Daisy indicated baseline, so it is a global baseline, that we can certify and say as a third-party, these things me that accessibility baseline. That’s exciting when you start to say, okay, now let’s take the other side of it. Let’s go to school, and we have something called Buy Accessible, where a school is encouraged and knows what to ask for when it comes to accessibility. Now there are some tools that people who buy books for schools, colleges, etc. can say, what are the things that make a book accessible? I don’t even have to know all that. I just know to look for the seal of approval. It’s early days for this on the certification side, but it’s really encouraging that it’s starting to take wind. I would say the biggest point about born accessible that I probably should’ve started with his book share shouldn’t have to be the primary supplier of accessible books, especially not for students in schools. People should be able to buy accessible books. I’m a big believer in libraries, so I definitely think it’s great to have an accessible library like book share. But it shouldn’t be the only way people can get an accessible book. The good news is there are other ways now. There are more people using Audible and other services that help make books accessible. But that’s not for your tenth grade sociology textbook. So we’ve got to make this better, and we’ve got to make more books just born accessible from the start. JOSH ANDERSON: I think I see that more these days where people are finally starting to think, hey, how do we make this accessible at the beginning as opposed to making it an afterthought, which usually makes it twice as hard and especially harder for people with disabilities. BETSY BEAUMON: And makes it twice as hard and makes it expensive. As software people who do with either digital content or software itself, if you don’t build some of this stuff and from the beginning, it’s not happening. In fact, one of the things I said when we first kicked off some of this work on board accessible was there is a window right now where publishers — and that start to extend into other related fields in this digital, connected space we are in now. There is a window where they are going to redo their processes and redo the way that they create books because they are going to be born digital. But that window closes at some point. They’ll always make some updates, but we’ve got to get in now while this whole industry is shifting. I’m very proud that we’ve jumped into that. And our diagram center — and a lot of people don’t know about diagram that know about book share. The diagram center is also funded by the US department of education, the office of special education programs that funds book share and born accessible. Diagrams is an R&D center that works on all those standards and tools and trainings. We’ve trained many publishers, academics, assistive technology folks on things like how do you do a good image description. So we’ve tried really hard to provide the tools and all those carrots that help make this future happen. Instead of saying do it, we are trying to help do it. JOSH ANDERSON: You may have already answered this couple what are you most excited about in this new position? BETSY BEAUMON: There is a lot I’m excited about. First I have to say I’m very honored. It’s always daunting a little bit to take over, especially as a CEO of an organization. It’s particularly an honor to take over from a founder. It is a little bit like someone handing you their child — I can’t really say it’s a baby anymore because it has grown. I feel a great sense of responsibility to the people we serve. I feel a great sense of responsibility to our staff, our volunteers, our board, our partners. So there is definitely a sense of honor and responsibility and a huge sense of excitement. I’m excited to really see out this book share going more global when we are not only the biggest accessible library in the world, we are really the only one that is explicitly global. Most of the other groups we work with our national or regional. We have over 30 languages now and going crazy adding more and working with making sure that we have free library services. So I’m very excited about that. I’m also really excited about some of the new still we are working on. One of the things we started four years ago as I became president of the Benetech was Benetech labs. Benetech has always done innovation, and that’s a big part of what we are about. We do innovation everywhere. But Benetech labs was really instantiating that sense of innovation and putting in place an actual group to go on top of the mechanisms we already had and the sort of checklist — we had checklists like venture capitalists have checklists about new ventures, but hours are all about impact. We look at lots of criteria. Now we have Benetech labs. We took a real gamble and said we are going to look at some new areas in Benetech labs. Some of those are really starting to look super interesting and coming to the fore. I’ve mentioned a number of them, but I’m really excited about this and impact we can have, and frankly, having more impact on the people that we’ve already been serving with book share. Our work trying to amplify the voices of people with disabilities, we are calling data for inclusion. It’s really taking that 15 plus years of human rights work and data around human rights abuses and stories. How can we amplify stories of people with disabilities that you don’t always hear about? This is all over the world. This is absolutely in the US where, as many of your listeners know, it is still not some kind of easy haul. But it’s also in places where the situation is far more dire in Africa and Asia. There are some real issues that people with disabilities face. We can help fix those because, in the human rights world, you learn that one of the ways you do that is amplifying the real voices out there as well as working with international organizations and local groups who are working on the costs. Just like we are empowering those social service referral agencies, we can also help empower disabled persons organizations and small NGOs all over the world that work with people with disabilities to say, you know what? We can help you work together with data and really amplify some of the so that it can impact the discussions around CRPD. JOSH ANDERSON: If our listeners want to find out more about Benetech, how would they do that? BETSY BEAUMON: They do that by going to Benetech.org. That’s B-E-N-E-T-E-C-H dot org. all of our work is listed there. The new stuff I’ve been talking about is all listed, either under innovation spotlights, under our work, or I would absolutely recommend checking out the block and signing up to get updates from the Benetech blog, because we are often blocking about all of these issues that are really important and that all tie together. JOSH ANDERSON: I’m excited to see the things that you do at Benetech. Seeing that kind of excitement and joy in someone taking over a new position is always a really great thing. I can’t thank you enough for taking time out of your day to come and talk to us. BETSY BEAUMON: Thank you very much. I encourage anyone out there who is interested in Benetech to check us out. There are lots of ways to connect with us as volunteers, just giving us a shot out occasionally on Facebook or twitter, or frankly just telling us where we can do better. Thanks very much and I hope to talk to all of you soon. JOSH ANDERSON: Maybe we will have you on the show in a year or so and see however things going. BETSY BEAUMON: I’d love it. JOSH ANDERSON: Perfect. Have a great day.